New Avid NEXIS software release delivers greater system bandwidths, enables scalability to larger storage capacities, and now offers support for Pro Tools to optimize professional audio production workflows. Avid has announced the upcoming availability of the latest version of Avid NEXIS™, the world’s first and only software-defined storage platform for media. Like all Avid applications and solutions, Avid NEXIS is powered by the MediaCentral® Platform, the most open, tightly integrated, and efficient platform designed specifically for media. 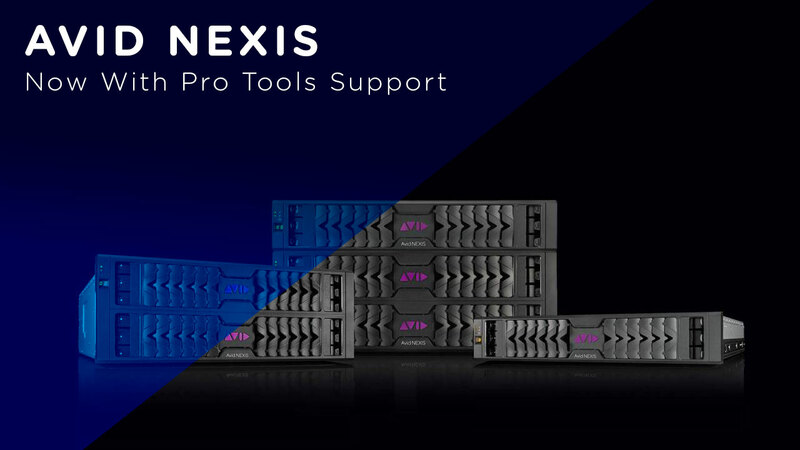 With the latest software release, Avid NEXIS and Avid NEXIS | PRO systems will provide the fastest, most efficient and reliable workflows for real-time media production, including highly intensive professional post-production and broadcast environments. It also introduces new collaborative shared storage workflows for professional audio production with support for Avid Pro Tools®. For larger post and broadcast environments, Avid NEXIS enterprise-class storage systems (E5, E4, and E2) offer greater performance for finishing and specialized media workflows, providing up to 28 GB/s of bandwidth with new high-performance storage groups. For smaller environments, Avid NEXIS | PRO professional-class storage provides the industry’s most comprehensive collaborative capabilities while also delivering real-time 4K performance at up to 2.4GB/s, all at an even more cost-effective price point. Avid NEXIS and Avid NEXIS | PRO also provide real-time creative team collaboration using not only Avid Media Composer®, but other editorial and creative tools including Adobe Premiere Pro CC, Apple Final Cut Pro X, DaVinci Resolve and more, as well as allowing for easy integration with third-party asset management systems. Avid Pro Tools, the industry-standard digital audio workstation, is now qualified on Avid NEXIS, enabling audio creative teams to also leverage the industry’s most efficient and powerful media storage environment. With Pro Tools combined with Avid NEXIS, users can share projects on a centralized pool of media storage, turning work around faster by eliminating the time wasted moving files between different systems. High-performance storage groups, with each media pack capable of data rates up to 50% faster at 600MB/s, providing the performance needed for high-volume 4K/UHD, HD, and bandwidth-intensive media workflows. Capacity to play back over 215 streams of DNxHR-encoded 4K media at high quality, or almost 1,400 streams of DNxHR-encoded 4K media at standard quality. Scalability enhancements that double the capacity of Avid NEXIS | Enterprise systems to support up to 48 media packs across a single scale-out networked system. Customers can mix and match a combination of Avid NEXIS | E5, E4, and/or E2 engines, providing nearly 3PB of storage capacity and 28GB/s of high-performance bandwidth. The Pro Tools software version, which adds optimized workflows for Avid NEXIS, will be available late Q2. The new version of Avid NEXIS is available in Q2. The latest software updates will also be available to all current Avid NEXIS owners who have an active annual support and software maintenance plan. Call or Live Chat with an RSPE Specialist today to find out how Avid NEXIS can upgrade your studio or facility's shared storage.